What is the marriage ceremony for Sikhs? The Sikh marriage ceremony is called “Anand Karaj” (literally meaning: The Ceremony of Bliss). The Sikh Anand Karaj was given a legal recognition in 1909 in India, under the Anand Marriage Act. It has been observed since the early days of Sikhism. Sikh boys and girls are married according to its form when they are grown-up and fit to undertake matrimonial responsibilities. Marriages are generally arranged and assisted by parents, though there is no bar to the boy and the girl arranging it on their own. The Sikh wedding ceremony is called ‘Anand Kaaraj’ which literally means ‘Ceremony of Bliss’. Marriage is a spiritual identity, not just a love affair between two people. The focus of a Sikh marriage is not based on romantic love or physical liaison, though these aspects are naturally part of married life. The Sikh marriage is all about love, but what kind of love? It is the Love of the Soul-bride for God, that longing to unite with the Infinite. A Sikh marriage is two people trying to help one another in this divine union. The highest love is assisting another in the union of the soul with the infinite, and helping the beloved to find the true purpose of their life. The four nuptial rounds (Laavaa’n) were written by the fourth Sikh Guru, Guru Raam Daas, for his own wedding. In them he tells us that the first commitment is for one to be true to one’s own soul, to be committed to righteousness, be on the spiritual path and communicate with the soul through personal spiritual practice. Then the Guru tells the couple that they have met the True Guru, they can get out of their ego identification and sacrifice to the unity, to the merger, and rise above their personalities and judgements. Commit to the institution of marriage as part of one’s spiritual path. Next, the couple are told that they have been blessed to be a part of the Saadh Sangat (the Company of the Holy), and that their lives should be an example of service and divinity to all around them, to fulfil the great destiny they have been given. Finally, the Guru says that the merger has taken place with the Infinite, because one has followed his advice. Each has inspired the other towards that divine union. 1. Departure of Baraat: Baraat is the term used to describe the party from the Grooms side. The Baraat will leave from the Groom’s house to the Gurdwara where the wedding will take place. 2. Reception of Baraat: The Groom’s party is “received” by the Bride’s party at the Gurdwara. 3. Milni: (means “Introductions”): When the groom’s party arrives outside the Gurdwara they are greeted by the bride’s family. Usually a short prayer is recited to welcome both families followed by the formal public introductions of the main male relatives in the families. Groom arrives at Gurdwara with family and friends. 4. Tea: Tea with vegetarian savouries and sweets will be served and are normally taken standing at tables. Chairs are seldom provided. The actual marriage ceremony takes place in the Darbar Sahib (the Guru’s Court/main hall) in the presence of Sri Guru Granth Sahib, the Sacred Scripture of the Sikhs considered as the Living Guru, the Living Voice of eternal wisdom. Whilst guests make their way to the Darbar Sahib, musicians sing hymns using musical instruments. 5. Pallaa Ceremony: Once the The father or a senior member of the bride’s family gives away the bride and places the Pallaa (long scarf) of the groom into the hands of the bride symbolising that from now on the husband’s duty is to honour, cherish and support the bride and that the bride and groom are bound together. Whilst this ceremony is being conducted the Raagis (musicians) sing appropriate hymns. The father of the bride handing over the groom’s scarf into his daughter’s hand. 7. Ardaas (Standing collective prayer): The congregation stands up to do a collective prayer to seek the Guru’s permission for the marriage ceremony to begin. 8 – Laavaa’n – There are four marriage hymns: The Bride and Groom will listen to the first hymn. At the completion of this they bow down to show acceptance. The same hymn is then sung by by the Sikh religious musicians whilst the Bride and Groom walk around Guru Granth Sahib as a physical commitment to the vow and to express the fact the Guru is the centre of their lives. The conclusion of the ceremony is followed by Keertan (singing of sacred hymns) to celebrate, and the congregation usually offers a donation to the musicians as a token of joy. The couple walk around Sri Guru Granth Sahib Ji during the ceremony. 6. Keertan: To celebrate the joyous occasion the whole congregation sing hymns from Sri Guru Granth Sahib Ji. 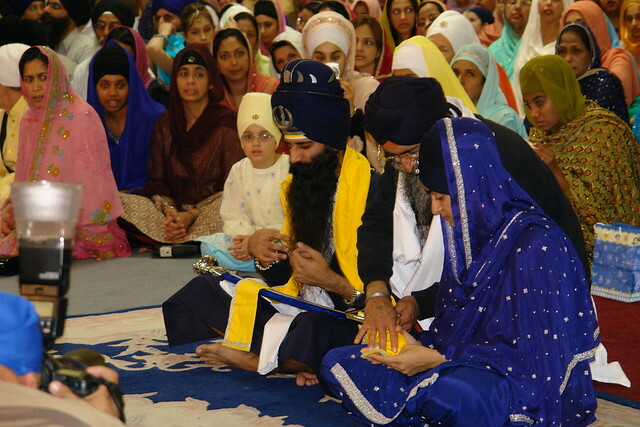 Keertan being performed in the Darbar Sahib. 7. Ardaas (Standing collective prayer): The congregation stands up to do a collective prayer to thank Guru Ji for the completion of the marriage ceremony. 8. Karhaah Parshaad: Blessed “Sweet pudding” is served as a form of sacred communion. (It is made of wheat flour, sugar, clarified butter and water). It is received with placing both hands opened and placed together. 9. Sagun (Gifts): Both parents congratulate the couple in the presence of Sri Guru Granth Sahib Ji. In many cases guests present the couple with gifts of a cash offerings in their lap, which contributes to the couple’s new start in life. Guests pose with the couple for photographs and offer their gifts. 10. Langar (free-communal meal): In accordance to the Sikh code of conduct, the Sikh wedding ceremony is concluded with the communal pure vegetarian meal (Langar) shared in the Gurdwara.